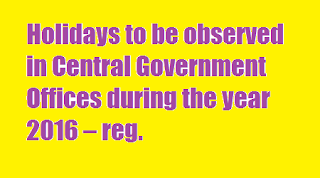 CENTRAL GOVERNMENT EMPLOYEES NEWS: Holidays to be observed in Central Government Offices during the year 2016 – reg. 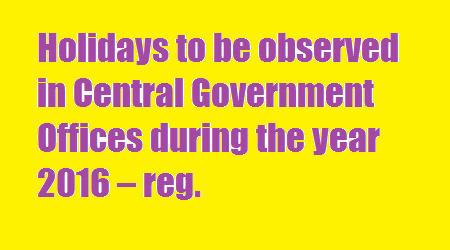 Holidays to be observed in Central Government Offices during the year 2016 – reg. Subject: Holidays to be observed in Central Government Offices during the year 2016 – reg. It has been decided that the holidays as specified in the Annexure -I to this O.M. will be observed in all the Administrative Offices of the Central Government located at Delhi/New Delhi during the year 2016. In addition, each employee will also be allowed to avail himself/herself of any two holidays to be chosen by him/her out of the list of Restricted Holidays in Annexure – II. NAVRATRA / NAURAJ/CHHATH POOJA/KARVA CHAUTH. 6. During 2016, Diwali (Deepavali) falls on Sunday , October 30, 2016 (Kartika 08). In certain States, the practice is to celebrate the occasion a day in advance, i.e., on “Narakachaturdasi Day”. In view of this, there is no objection if holiday on account of Deepavali is observed on “Naraka Chaturdasi Day (in place of Deepavali Day) for the Central Government Offices in a State if in that State that day alone is declared as a compulsory holiday for Diwali for the offices of the State Government.